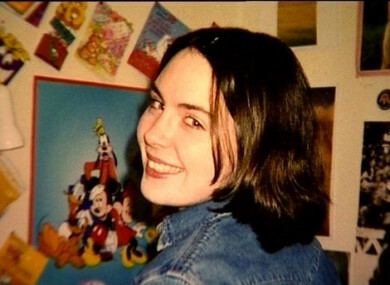 THE FATHER OF Deirdre Jacob has made a fresh appeal for information on her disappearance, hoping that the passage of time will allow people to come forward. Deirdre was last seen walking near her home at Roseberry in Newbridge, Co Kildare, at around 3pm on 28 July 1998. She had been due to start into her second year of teacher training in Twickenham in England, and had been on her way to send a rent deposit to her friend. There has been much speculation around the 18-year-old’s disappearance over the years, particularly as a number of other young women went missing in the country between 1993 and 1995. Last year gardaí received the information they needed to upgrade the investigation from a missing person’s case to a murder inquiry. Speaking on RTÉ’s Ray D’Arcy Show this afternoon, Michael Jacob said that the family still have hope that there is one person out there who knows what happened to Deirdre. He said that there may be someone out there who is in a position to now come forward who may have previously been held back “for whatever reason”. “These people are 20 years older and maybe much more mature and can look at things in a different light,” he said. The main thing to do is consider what the right thing to do is. We all probably bottle up things, but in this case the right thing to do is to come forward and give that information to the gardaí. Describing the investigation as a giant jigsaw with scattered pieces, Jacob told D’Arcy said that “it will only become clear when those pieces are put together”. Making a further appeal, Deirdre’s father made asked anyone with information to come forward. “Don’t hold onto it any longer. Now is the right time, do the right thing. Help us bring Deirdre home,” Jacob said. Since visually enhanced CCTV footage was shown on RTÉ’s Prime Time last week, Jacob said there has been “a very good reaction” with a number of calls made to the incident room in Kildare. Email “'Help us bring Deirdre home': Father of Deirdre Jacob hopeful people will come forward”. Feedback on “'Help us bring Deirdre home': Father of Deirdre Jacob hopeful people will come forward”.